Ekphrasis: orig. Greek: a vivid, often dramatic, verbal description of a visual work of art, either real or imagined. Ekphrasis. In short, it’s art about art. It’s a beautiful word. It’s an awkward word. It’s hard to spell. It’s also hard to pronounce. I usually end up saying “eggsphrasis,” and then it becomes a brunch dish. But this word catalyzed a group of writers and artist together. 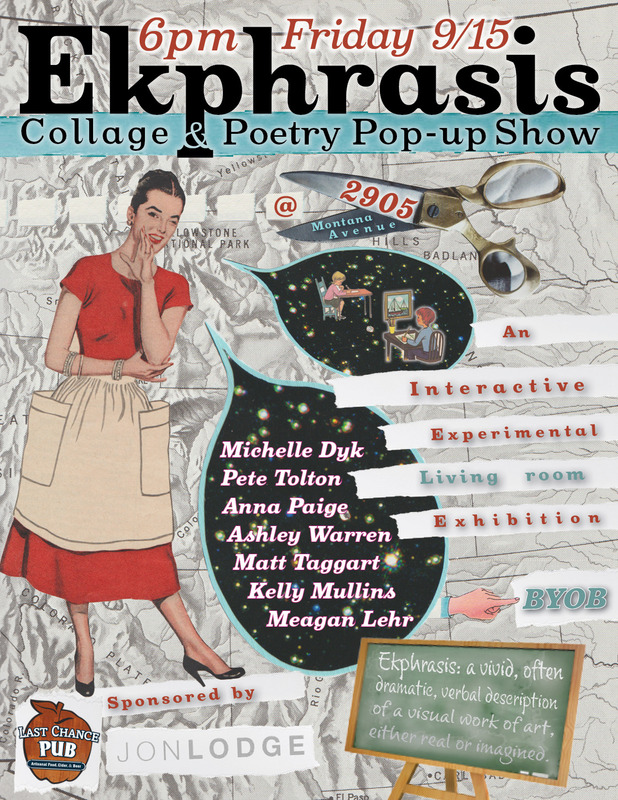 Along with Michelle Dyk, Pete Tolton, Ashley Warren, Matt Taggart, Kelly Mullins, Meagan Lehr, I am pleased to announce Ekphrasis: A Poetry & Collage Pop-up Show, taking place at 6PM on Friday, September 15 at 2905. For the past several months we’ve been prepping for Friday’s event. Now that it’s a week away, I’m feeling a bit crazy. Not only are we showing the work we’ve produced and reading the poems we’ve written (or….if you’re like me….still writing), we’re literally packing up our living rooms and reconfiguring them in the venue space, named for its address (2905 Montana Avenue). We’re calling this “sudden spaces,” a pop-up of a magnitude I feel a bit overwhelmed by (especially given the fact I just sold my home and packed up all my things, unpacked them…and am now repacking them to unpack…you get the idea). Why? Why not, really. These little living areas transplanted from our homes will be arranged throughout the event space and serve multiple functions: exhibition galleries, performance halls for poetry readings, and art studios for expository creations. Just as we share our work, we wanted to share the spaces in which we live and work, a reflection of us as artists and writers. Bringing all those spaces, art, and words together in one night is the culmination of our cooperative efforts, a diptych of visual media and written word. (Yeah, I didn’t know what that word meant either…but it’s art consisting of two hinged pieces). Writing poetry from another artist’s viewpoint isn’t without its challenges. But the artists have been very open to the poets interpretation of their work. “A picture inspires a thousand words,” said artist Michelle Dyk. “I wanted to see what poets’ words would do, even just ten words.” The results are diverse—impressionistic, playful, heartfelt, and most of all, inviting. Join us on Friday, starting at 6PM for this one-of-a-kind-never-to-be-reproduced (mainly because I don’t ever want to move again) show. We’ll have beverages provided by Last Chance Cider Mill and Pub, though we do ask that you BYOB in the sprit of the living room. Visitors are invited to participate in producing their own small works of collage and poetry, so bring any bits of poetry or print media you may like to adapt into a new work of art. We’ll have supplies handy and a lot of good people to share their knowledge and enthusiasm for exploratory art forms.